Now Sync My iTunes is installed on your machine.We hope by now you have installed "Sync My iTunes" on your Playbook from Blackberry App world as well. Step 1 : On you PC,right click on the try icon and select "Setup Music to be Synched" as shown below.Before doing this,make sure that "iTunes" is running and is open on your PC. Step 2: You will get the below window.This is the main screen of application.There are two panel in the screenshot below. 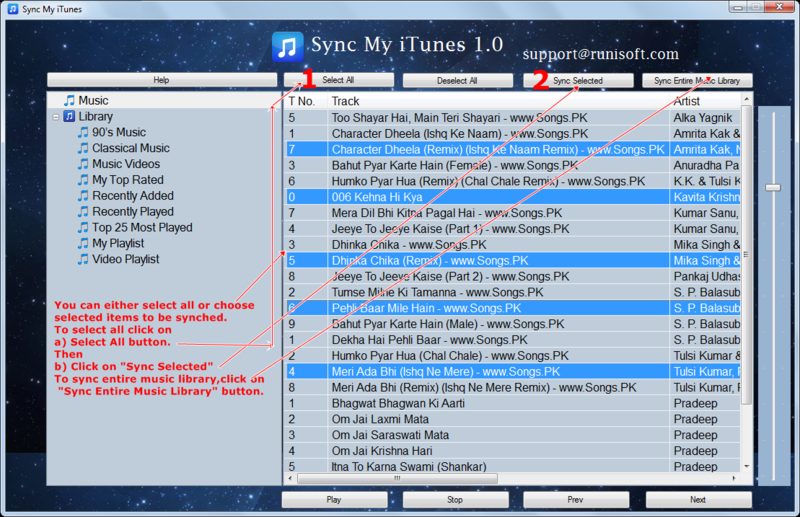 a) Music - If you click on Music,it will display the entire music collection that you have on iTunes.The collection will be shown in the right pane.You can either sync selected items from the list or click on "Select All"
button to sync all items from your music collection.Alternatively,you can directly click on button "Sync Entire Music Library".This is a "One button" sync for all music collection.If you are clicking on "Sync Entire Music Library",you do not need to select songs or use select all button.You can directly use this feature. b) Library - In the left pane you can expand libray.It will show you all of you playlist(for example i created "My Playlist" that you can see below).Not only the playlists,but also it shows you the other categories like "My Top Rated","Recently Added","Recently Played","Top 25 most Played" etc.You can sync any of them to your playbook. Not only this,if you want to copy only selected itmes you can do that as well.To select multiple items,press the "Ctrl" key and then click on the songs you want to be synched(shift key can also be used for selection).Once you are done,click on "Sync selected" button to sync the selected items to Playbook.